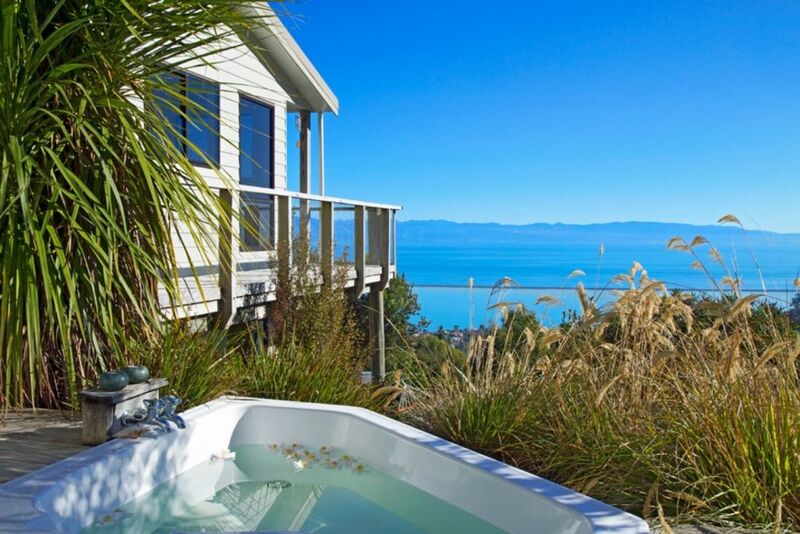 Sweeping views take in the beauty of Tasman bay all the way to Separation Point on the coast of the Abel Tasman, framed perfectly by the often snow capped Western ranges and the prominent peak of Mount Arthur. Timber decks circle the house with outdoor dining, outdoor bath tub, large hammock and access to the stunning salt water swimming pool and garden setting below. An intimate hideaway for couples but also a fantastic place for large family gatherings or a friends reunion. Wonderful in summer with the pool, great in winter with the wood burner. Sensational views all year round. This nature setting is alive with bird life and at night time Glow Worm's can be found a couple of minutes walk from the house. The property has resident sheep that are friendly and can be hand fed. They love been fed bread. The home comprises of a main lounge and dining area with SMART TV, NETFLIX and LIGHTBOX. A second downstairs children's den with Freeview Plus and DVD player. This has an extensive range of toys, games and a blackboard to entertain the children. Personal meet and greet is available for this property and on call assistance throughout the stay. Included in your stay are all utilities, linens and towels, use of property amenities including unlimited WiFi and pantry and sanitary basics. For longer stays a weekly refresher house cleaning service inclusive of linen and towels can be arranged at an extra charge. (please note the property must be left in a tidy condition at departure. Heating - there is a wood burner and heat pump with a heat transfer system in the main living area. Electric heaters with electric blankets in all other rooms. Airconditioner and fans for the warmer weather. There is a convenience store in the neighborhood just a few minutes drive from the home and for all other supermarket shopping, this can be done in downtown Nelson only a 10 minute drive away. The place is in the hills above Atawhai, Nelson. The views are stunning and the peacefulness makes the place so relaxing. The very private pool gets the sun from late morning . The amenities are great. Smart TV, excellent wifi reception, coffee machine etc. Sheep are regular visitors and enjoy a feed of white bread. Beryl’s communication was excellent and we were made to feel very much at home. Highly recommended for families! A stunning secluded spot with all the comforts of home plus more! We had a wonderful stay at this beautiful property in Atawhai. If you are after seclusion then this house is perfect for you! The house is clean and tidy and incredibly well appointed. We cooked every lunch and dinner of our stay in the kitchen which had everything we needed. The kids were kept well entertained in the beautiful pool and with the great selection of toys and games on hand. Contact with the host, Beryl, was friendly and prompt and she had even left a thoughtful welcome package (milk in the fridge, choccies, chippies, wine) which was such a lovely gesture after the car trip to get there. We will most definitely be returning. Thank you Beryl! Was very excited to stay at the location (I mean look at how nice the pictures are). Ended up very disappointed. For one the pool was poorly maintained and had more dead insects than sheep in Nelson. We also werent given the key to one of the rooms provided and had to get 'creative' and access it through e windows. Jaw dropping views. Fantastic house, fully kitted out. Very comfortable, wonderful place to spend my 50th with a bunch of girlfriends. The drive up to the house is long, winds around and steep in places, had we known we would have hired smaller vehicles, rather than a massive 12 seater van - the driveway added to the excitement of the stay. Couldn't fault it otherwise. Will definately be back some time. Thanks Beryl for some wonderful memories - Katrina. Loved our stay here, in fact probably the favourite of our trip! Wonderful privacy and just a comfortable, cosy place to relax and enjoy those great views. We didn't use downstairs but was good how the fireplace has a switch you can divert the heat down there to warm it up. Agree with previous review about the driveway, for a nervous driver it is steep in some parts. But it was all part of the adventure for us, and loved how coming up and down we would sometimes have to wait for the sheep to move. :) Yes we are city people. Would stay here again for sure! Thank you.